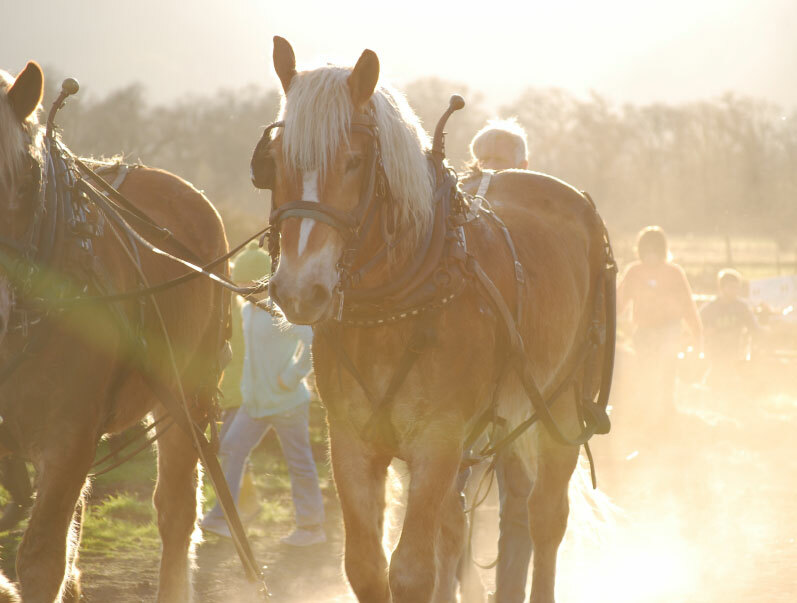 A seasoned teamster speaks on how to train horses for farm work - and on how to train the people who drive them. 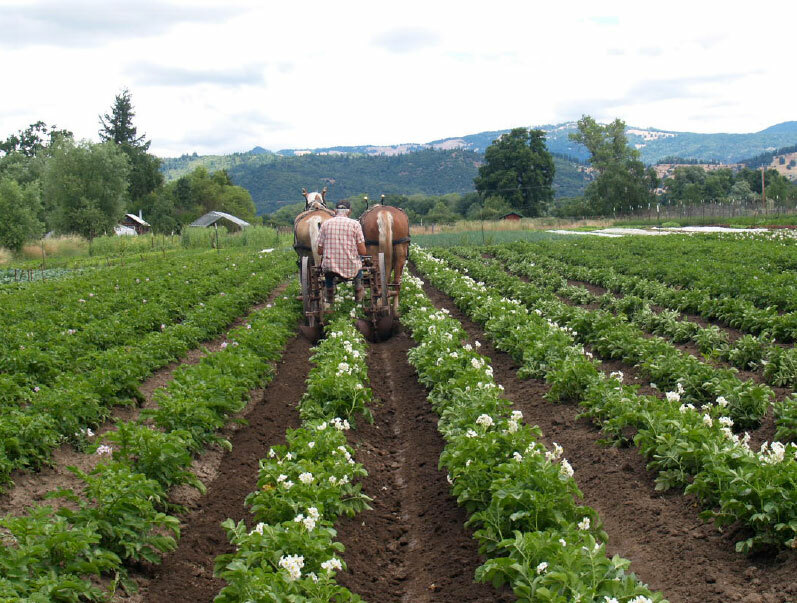 My training was with double dug, bio-intensive agriculture with Alan Chadwick in the 1960s at UC Santa Cruz. So my starting point was working by hand. But I became interested in growing grain and doing some larger scale stuff, so I thought animal power would be a good approach. I’ve never been that excited about tractors. I appreciate the power they have and what you can do with them, but I don’t appreciate the impacts on the environment and climate and even on your body when you’re driving them and breathing the fumes and getting the vibrations. I had to teach myself. I ended up with some donkeys at first, which wasn’t a bad thing because donkeys don’t panic the way horses will panic. They taught me a lot (laughs). The only problem was a donkey weighs 400 pounds and a draft horse weighs about 1,600 pounds. So you have four donkeys worth of power in one draft horse. 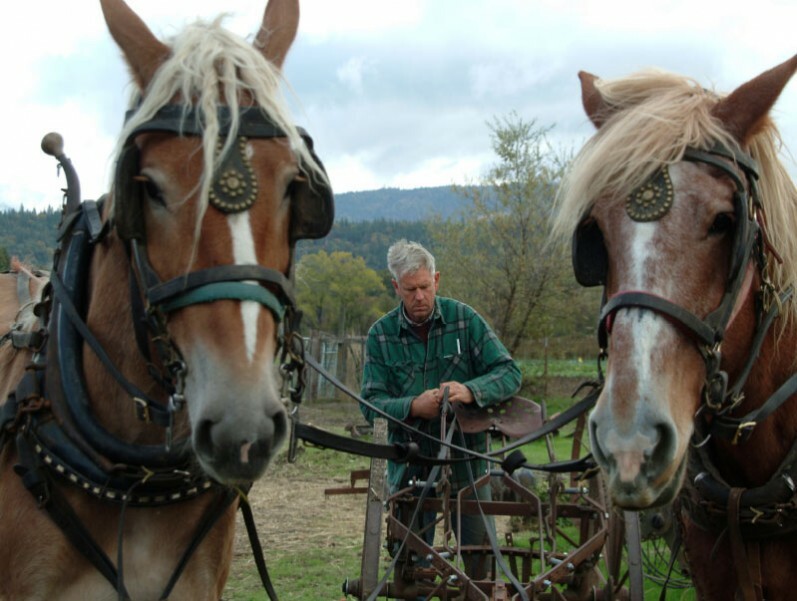 And if you put two or three draft horses together you can really do some significant work. We now we have six Belgians. We probably could manage with four, but one of the teams I have is an older experienced team that I use for people who are just learning to drive. It’s a bad idea to put green drivers with green horses. You’re asking for trouble. It’s important to understand how horses communicate with you, so that you can communicate with them. In the past almost everyone grew up around horses, so people had what they called “horse sense.” I think horse sense is just knowing the animal by living around them and knowing what to expect from their behavior. We don’t know that nowadays. So you’re dealing with an animal whose behavior you don’t understand, and if you do the wrong thing or don’t know how to respond to them, things can escalate into a panic or a runaway situation, and that’s really, really dangerous. When you’re hooking up horses to equipment, for instance, where you stand is really important. If something goes wrong, you don’t want to be standing directly between the horse and the yoke. You want to be in a position where you can move aside quickly. Because if something does happen and you’re in the wrong place, you won’t have time to do anything about it. There are two schools of thought in horse training and horse handling. One is the old-school way of subjugation – breaking the horse to your requirements. People used to believe that you had to overpower the horse, even physically throwing them to the ground with ropes, to get a response. You can do that, but then you get an animal that is responding out of fear. And that’s not a good working relationship. 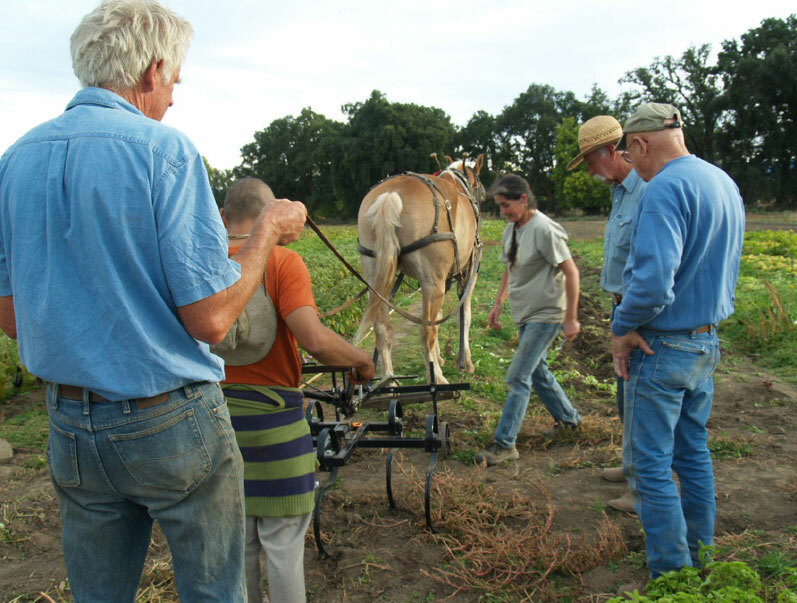 In looking for a horse farmer mentor you want to find somebody who is very clear in their communication with the horses and gentle, but totally firm – not losing their temper or getting into an argument with the horse. That’s not the way to do it and it doesn’t have to be done that way. The modern approach is called “round pen training” where you’re working with the horse’s instincts. Horses are a prey animal and if you’re driving them, you’re part of the herd. In the herd there is a dominant member and that dominant horse will signal to the other ones things like, hey get away from the water. And the other horses will generally accept that leadership. So, if you’re in the middle of a round pen and you face them and look them directly in the eye, they will take that as a predator stance and they will try to get away from you. They will go around and around in the pen, which is usually about a 40 feet diameter, but they can’t get out of it so they go around until they realize that you’re not going after them, that you’re just keeping them moving. You can tie a paper bag on the end of your whip and just leave it in the air – that’s usually enough to get them moving. After a while they will learn that you’re not threatening them, but that you are asking them to coordinate with you, to work with you. When they start to consider that maybe you’re not going to hurt them, they’ll point their ear towards you and start to look in your direction. As soon as you see that sign, you stop being the predator. You turn your shoulder and your back to them, so you’re no longer confronting them and they’ll pick up on that. That’s communication that is in their language. That’s what horses do when they’re going to scare the others from the water. They’ll turn away and adopt a less aggressive and more accepting stance than the dominant horse, who says, okay don’t worry. That’s called joining up. The horse will actually come to you in the center, come to your shoulder, and start to follow you around the pen without any halter or ropes or anything. You’re establishing communication with that horse so that it knows that you know its language and how to communicate with it. When the horse has confidence in that, then you move in towards them and start rubbing them all over their body with sacks or ropes. If they are not willing to accept you when you do that, then you immediately send them back around the ring again, until they are willing to accept you. After a while they will learn that you’re not threatening them, but that you are asking them to coordinate with you, to work with you. That way you end up with a horse who is not responding out of fear but responding out of acceptance of your leadership, and you have a much better working relationship. You have to train the driver before they can start driving a horse. The first step is to learn how to work with the lines, which are like the reins on a riding horse. In workshops we actually have people act as the horses and hold the bit in their hands right behind their back. We hook the driving lines onto the bit, and then have the person who is learning to drive use the lines to drive those people around. Then they switch off, so they can each feel what the horse feels when the bit is in their mouth, which is one part of how you communicate with a horse. If you use too much pressure on the line, it makes for an unresponsive horse and can also hurt them. You want enough pressure to have a response, but as little pressure as you can manage to get that communication. The lines are used in conjunction with voice commands. The most important command is whoa. If you give a whoa, you’re asking the horse to stop right there, right then in that step. You’re not saying whoa, and then allowing the horse to take another three steps and then you’re saying whoa again – if you keep doing that you’re just telling the horse that it can keep walking and you’re just going to keep saying whoa. That’s detraining the horse. If you know that you’re going to stop in 30 feet, you can give the horse a little preview with the lines by giving them just a slight touch on their mouth, once, twice, three times, and then say whoa and give a firm tug on the lines. Then the horse gets a heads up that it’s going to be asked to whoa. If you’re hooking horses onto implements you have to signal them to drive over the tongue, and they have to stop before they get past the tongue, so your whoa has to be pretty precise. If they take just one step further you want to say whoa again and stop them right then and there, and get them to put that foot back where they were. Then they learn that that’s not acceptable. The only thing that’s acceptable is to just stand totally still. You have to be pretty loud with the commands when you’re on equipment because there is noise going on. You have to be really present to get that response. They should be following the pattern of activity that you have imagined already in your mind. And you should have that clearly imagined. Before you get to a turn, you should be imagining where you’re going to turn and how you’re going to turn. You always have to take turns really wide because you have equipment behind you, and if you cut it too tight, the equipment is going to hang up on the gate post or whatever is there, and you are going to be in big trouble. They’re creatures of habit and they will feel confident and comfortable if they get the same commands and signals again and again and again. To get the horses moving people use various commands, from just smooching their lips to get up or let’s go. It’s best to use something that you’re not going to be saying in conversation, like ok. You don’t want to say ok when you’re sitting there talking to somebody and have the horses here that and then suddenly off they go. What I like to do is train them so that when the lines are relaxed and there’s no pressure on their mouth, they should be standing still. The only time they’re moving is when they feel the lines at their mouth. It’s actually a good thing to see-saw slightly, just touching in on one side and then releasing it and touching in on the other side. Any solid pressure will ultimately reduce response. You want to have pressure and release, pressure and release. That’s the key. Then it becomes a communication tool. They will also feel confident because they know what the program is. When I’m getting ready to start the horses moving I have the lines loose and I say horses. When I say that I want to see their heads come up and their ears come back, so I know that they’re awake and paying attention. Then I take up the slack in the lines and at the same time I say step. That means I want them to step into the load and start to pull. Gee is the command for a right-hand turn, haw is for a left turn. Gee and haw are for sidestepping, so they should not be moving forward when you say that. They will sidestep until they are in a completely new orientation. When you give them a command like that they will just keep going around in a 360 until you stop them. So when I get them in the position where they’re going to go again, I say step. They’re creatures of habit and they will feel confident and comfortable if they get the same commands and signals again and again and again. If you start mixing it up and you say let’s go, instead of get up, if that’s your usual command, they’re going to get confused. And some horses will get really nervous about that. So you want to keep the commands simple, clear and really firm. To go in reverse, I say back. It’s kind of like whoa; you do both lines at the same time and keep the pressure there until they move. If you want them to do just one step like move their foot off of a line or something, you can bump their foot with your foot. Sooner or later they learn to pick that foot up. There are all these nuances to communicating, but if you can get them down you really have a wonderful experience for both them and for you. Driving horses is not a thing to take lightly, off-the-cuff. Somebody can learn to drive a tractor with a few instructions, but you have a key that you can turn off and you have brakes. You may make some mistakes and goof up the tractor, but with horses you can’t take that risk. Somebody can learn to drive a tractor with a few instructions, but you have a key that you can turn off and you have brakes. You may make some mistakes and goof up the tractor, but with horses you can’t take that risk. A horse has to stop when you say whoa – right now, right there – and if you’re not at that point don’t hook on to equipment and try go somewhere. You never know what can happen – a bee can come sting them, a tree limb can break and make noise, there’s all kind of things. If something makes a sudden noise, particularly with a green horse, for all they know it’s a pack of wolves behind them. And once they shoot adrenaline into their system, there is no stopping them. It’s like defensive driving; you want to have yourself in the right position if anything is going to go haywire. Any horse will run if it’s really frightened, and you have to be prepared for that. If you don’t have horse sense from previous experience and time spent with horses, you may not know when they’re getting upset. If something starts to go wrong, you might not even know that anything’s going wrong. And then stuff escalates. Starting with a horse that is not too spooky or worried and has had a lot of experience with farm work is way safer than starting with a powerful young animal that is not used to it and can get frightened. Horses are really sensitive and responsive, and they can be nervous. When looking for a horse to buy you can ask the previous owner if the animal is a nervous type are not, but you should also spend time watching them to get a sense of their personality. You can have the owner drive them and see how that owner gets a response. If they have to be super heavy-handed with the horse, that’s a bad sign. But if they just give them the command and the signal – and boom – they get a response, that’s the kind of horses you want to get. I don’t want to be discouraging to anyone, but there is a lot to know for the safety of yourself, for the safety of the horses, and for not breaking your equipment. In the past driving horses was a very specialized skill. The original nomenclature for those people was “teamsters.” These were people that really knew their job. And that’s all they did. If you’re trying to do absolutely everything on a farm and learning to drive horses, it’s tough – I started there, so I know. I’ve made a few mistakes, but fortunately not a lot. Besides starting with horses that are accustomed to farm work, I would try to go work with an experienced horseman, which there are now. When I started in the mid ’70s there were hardly any people around except a few old-timers you could go to. That way you can develop the right reflexes and save yourself a lot of trouble. 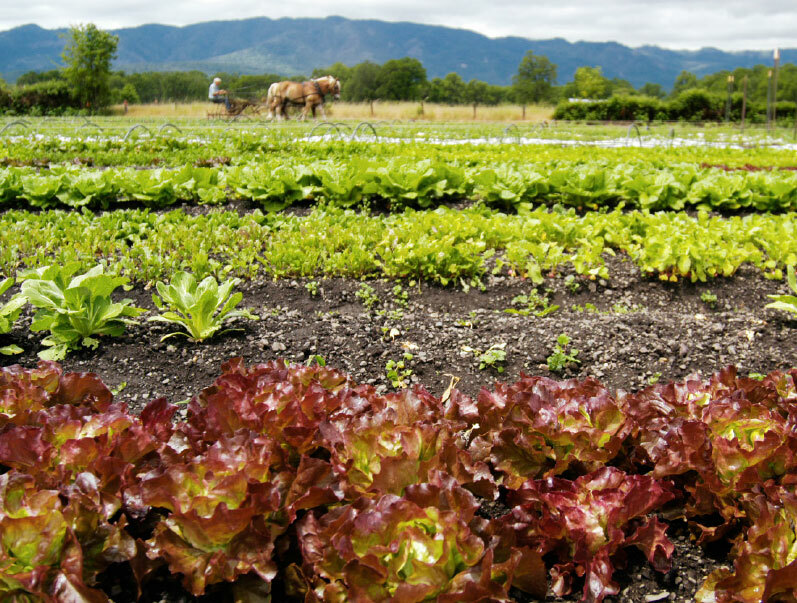 If you’re interested in an apprenticeship at Live Power Community Farm, visit their website for more information.